i finally got the chance to make myself a cute little mouse pad. i was kicking myself for not just buying one at the beehive bazaar last month. of course, i just think, oh i’ll just make one.. and of course i never do. so, i finally just sat down for a second to make one. and, seriously.. it was so easy, it ended up taking less than five minutes. i don’t know why i put these things off? here’s the instructions if you want to make one. 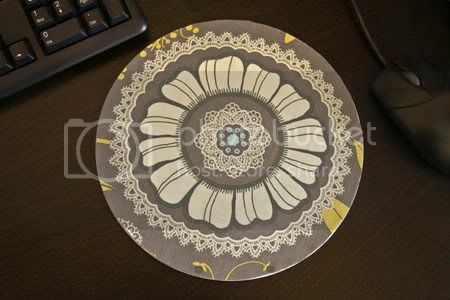 pick out your fabric and lay it under the mouse pad and cut out the general shape of the mouse pad leaving about 1 inch extra around the edges. next, take your heat n’ bond and follow the directions on the package to adhere it to the wrong side of the fabric. once it’s on the fabric, place the fabric back on the top of the mouse pad and position it how you want it, then iron it on the mouse pad according to the directions on the heat n’ bond package, then trim around the edges. next, apply a little fray check around the edges if you don’t want it to fray. easy as that! now you can grin a little every time you look at your mouse pad! Love it. I’m totally doing this when we move. Seriously……you made a mouse pad? I can make a pretty mean grilled cheese sandwich and that’s about it. You have more craftiness in your little finger than I do in my entire body. Is there anything you can’t make? seriously so cute. i might just have to make one. SO CUTE, love the Amy butler fabric, I have a pillow in that,. I think you need to make and sell these! What is fray check, please? what a great idea to spruce up my mouse pad.